Here go the twins and their Metal, aimed to please, distribute their appreciation and admiration for the melodic end of this exquisite music. Founders of the majestic brethren of TWINS CREW, David Janglöv and Dennis Janglöv, originating from Sweden, were able to assemble an astonishing group of folks embraced with great talents upon providing the world with downright classic Heavy / Power Metal fame and fortune, crossing paths with IRON MAIDEN, RAINBOW, HELLOWEEN, GAMMA RAY, STRATOVARIUS, LABYRINTH along with the line of melodic fanatics. Signing with the Italian Scarlet Records seemed rather natural for these guys, also since Italy is one of the foremost places for melodic Metal, and it is quite an honor for the release of their sophomore release, “The Northern Crusade”. After listening to this album for a few sessions, I came to a known notion of mine, time and time again, regarding me being convinced even more, and it has been a while since I took to review this profound unison of brothering subgenres, that this form is a safe bet, a golden chip to rely upon while writing Metal music. What I mostly liked about “The Northern Crusade” that the larger sum of the time flew by as if a racing car passed right through my face without making me flinch about it. Though there were a few epic songs, those were so refined that I didn’t even notice their length. 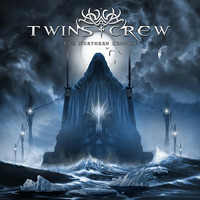 Eventually it starts and ends with the material in question, TWINS CREW wrote songs with an appeared intent on delivering it straight up, yet with being smooth, harmonic and fluent. Nothing within the music is awfully complex or ambiguous, every song has that same obviousness forged back in the 80s, yet it didn’t enervate or bored. Each track has its own quality and virtues without recycling the others in the process. When it comes to personal skills, I believe that the founders, both on guitars, are twin wizards, focusing their shred, partially Neo-Classical playing through the Malmsteenish style is conveyed with awesome precision, yet their playing also contributed a great deal to the clarity and power of the rhythm section that is intense as well. Furthermore, there is active keyboard man, and also the band’s newest addition, Nicko DiMarino, which maintained the certain Neo-Classical emblem on the band’s creations. Also I was overwhelmed by the frontman, Andreas Larsson, as it seems that these types of vocalists grow on trees in Sweden. I haven’ never heard of the guy nor noticed any other bands he participated in, definitely a keeper in this group. A part of the problem regarding Larsson’s role is that I don’t believe that he was set well into the overall mix, a little behind the rest of the band as he should be in the front center. Unraveling the classiness of 80s Metal with a little ventures towards a few modern enactments, “The Northern Crusade” grazed my skin with tasty hits. Although, as I stated earlier, there is a pattern between the songs, but each and every one showed its worth and effect. “Take This Life”, however heading towards the end of the album, heavily caught my attention with its HELLOWEENish nature, not fully Teutonic, yet with ounces of power, catchy melodic lead guitar licks and crisps of harmonies. Larsson nearly killed me with his performance. “Under the Morning Star” is one of those songs that I wish to long for just a minute or so, as it would terrible for them to end prematurely. Mainly a buildup ballad, eventually turning the chick to heaviness, cradles such an emotional chorus, slightly tacky but with the orchestration involved, it is simply magical. “Loud and Proud” is nothing more, nothing less of an 80s Metal hit, straightforward and pounding, a bit RAINBOWish, not in the range of “Long Live Rock N’ Roll”, yet more of the ACCEPT kind with sharper and stronger vocals. “Blade” and “Dr. Dream”, both Power Metal speeding bullets, cumbersome on those wonderful keyboards support, an incredible addition no doubt. Finally there you have it guys, a foundation of an unforgettable Heavy / Power Metal happening, an astute melodic title that you have to check out unlike most of the Swedish NWOBHM entries.